France, Germany and Italy have confirmed they’ll join China’s new Asian Infrastructure Investment Bank (AIIB). Participation in the rival to the US-led World Bank is seen as a setback for the Obama administration. The three European countries on Tuesday confirmed in a statement they intend "to become founding members of the Asian Infrastructure Investment Bank," according to AFP. "We want to bring our long experience... to help the bank build a solid reputation," said German Finance Minister Wolfgang Schaeuble, speaking also for Italy and France at a joint press conference with Chinese Deputy-Premier Ma Kai on Tuesday in Berlin. He added that the three countries want to make a contribution to the positive development of the Asian economy, in which German companies were actively taking part. 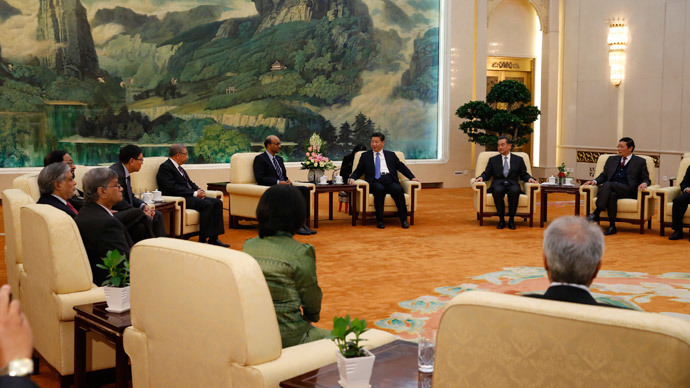 "Participation by countries outside the region will intensify the extensive representatives of the AIIB," he added. The decision of the three European countries comes after Britain last week became the first Western country to agree to become a founding member of the AIIB, FT reports. The UK government said the decision was in the country’s national interest, but it got a negative reaction from the United States. The new China-led bank is expected to challenge the Washington-based World Bank, so the US is increasing pressure on its allies not to join the institution.The US’ concern is that the new investment bank might not have high standards of governance and environmental and social safeguards. The new bank is expected to challenge the Western dominance of the US-led World Bank and IMF in global infrastructure projects, which experts believe will create healthy competition. “Our messaging to the Chinese consistently has been to welcome investment in infrastructure but to seek unmistakable evidence that this bank… takes as its starting point the high watermark of what other multilateral development banks have done in terms of governance,” US Regional Assistant Secretary of State Daniel Russel said in Seoul, the Financial Times reports. Meanwhile, Chinese officials say the AIIB's operation and governance will be open, transparent, inclusive and responsible. The three major financial institutions – the IMF, the World Bank and the Asia Development Bank will not be able to cope with the tremendous amount of work that needs to be done, investment advisor at Motley Fool David Kuo told RT. “You shouldn’t politicize something like infrastructure. People have a right to communication and a right to uninterrupted power - these are all parts of the infrastructure projects that many countries are crying out for,” Kuo said. He hopes that there will be a certain amount of competition with the new China-led investment bank. Kuo suggests Germany, France and Italy have much to offer the Asian people, as they can bring expertise as well as money. South Korea, Switzerland and Luxembourg were also considering joining the Asian Infrastructure Investment Bank, the Financial Times reported. Australian Prime Minister Tony Abbott said he would make a final decision on AIIB membership soon. South Korea and other countries are in discussions with China over possible participation. China’s main regional rival Japan said earlier this month that Asian countries including Japan have until March 31 to decide on becoming AIIB founding members. "They told us they are considering. Whether Japan will join, we do not know. It is Japan's own decision," Chinese Finance Minister Lou Jiwei said, according to the Xinhua news agency. Nearly 30 countries have confirmed their participation in the AIIB, which is aimed at helping finance infrastructure projects across Asia and is expected to come into being this year. The AIIB was formally launched by Chinese President Xi Jinping in 2014, and is expected to become a tool of a broader Chinese push for growing international power and economic significance.